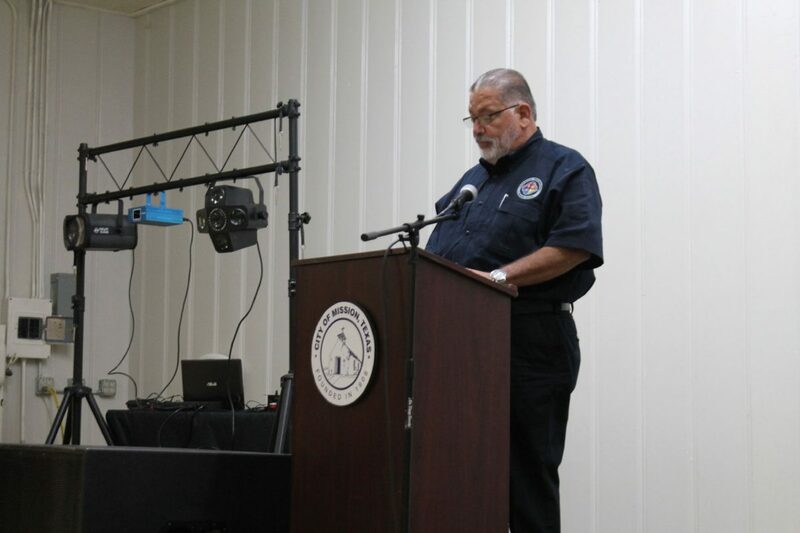 Antonio "Tony" Peña Jr., state coordinator for the Texas Division of Emergency Management Region 3, speaks to the first responders about how generous they were to assist the residents during a dinner in their honor Tuesday at the Mission Community Center. MISSION — First responders of the Rio Grande Valley were honored Tuesday at the Mission Community Center for their efforts during the aftermath of Hurricane Harvey. 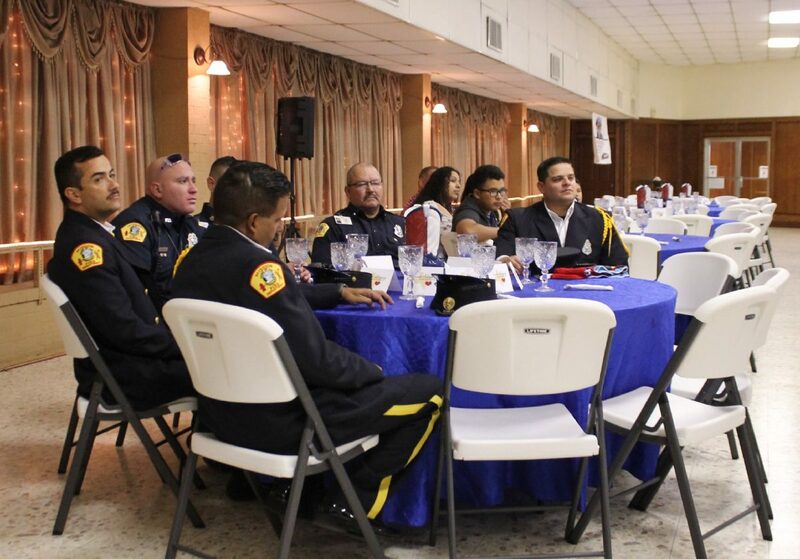 The city of Mission in-conjunction with Hidalgo County held the RGV Harvey Responder Appreciation Dinner for the first responders and their families as a display of gratitude and support from all four of the Valley counties who went to service the residents of Southeast Texas and the Coastal Bend after Hurricane Harvey in August. Mission Mayor Norberto “Beto” Salinas” thanked the first responders for answering the call of need and going to assist the residents in the hurricane zone in getting back on their feet. 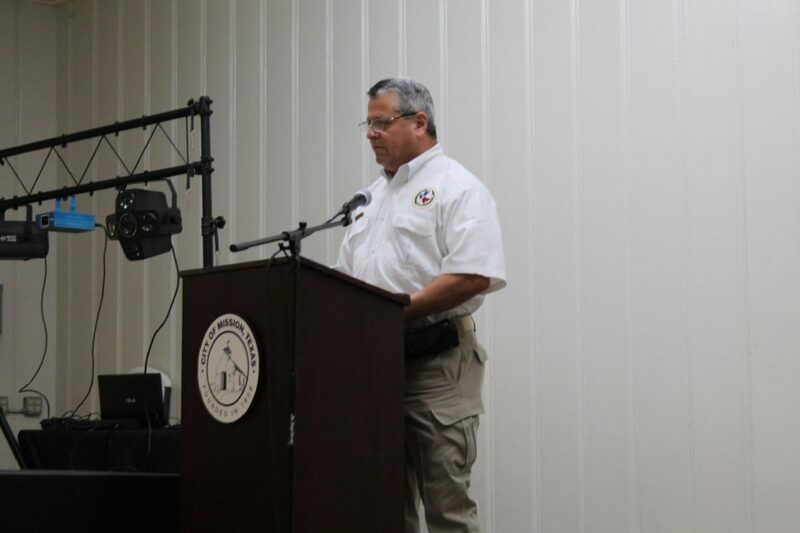 Ricardo Saldana, emergency management coordinator for Hidalgo County Office of Emergency Management, speaks to first responders Tuesday at the Mission Community Center. Group of Mission fire and police members listen to the speakers during a dinner Tuesday at the Mission Community Center. The Valley responders assisted with the aftermath for periods ranging from a couple of weeks to almost a month. Guest speaker Antonio “Tony” Peña Jr., Texas Division of Emergency Management Region 3 state coordinator, detailed statistics about the Valley responders efforts and offered words of empowerment. A note was placed on each table from the city of Mission that read: “Thank You First Responders” in all capital letters and read: “We greatly commend your unselfish efforts and commitment to the hundreds of families across Texas that were affected by Hurricane Harvey. Ricardo Saldaña, emergency management coordinator for Hidalgo County, also spoke of his appreciation to the responders. “You all stepped up to the plate because you all are part of a team, a team that makes Texas stronger and make the Rio Grande Valley proud of the communities you served,” Saldaña said. Master of Ceremony Eddie Olivarez, Hidalgo County Health and Human Services chief administration officer, said that during the period that the first responders were out helping, there was never a complaint after working many hours and with uncomfortable sleeping conditions.